3rd Dimensional Pleiadians: Two arms, two legs, body, head; the Pleiadian ears are somewhat lower than yours, but Pleiadians are so much genetically like you that they consider you to be their cousins. If a Pleiadian were walking down the street, you would all turn and remark about how they look (they look terrific). You would notice that they're different but wouldn't necessarily consider them alien. That's how similar physically and genetically they are to you. If you are in a Pleiadian civilization, the expression of love and sexuality at that moment is literally so complete and balanced and whole that there is no need to attach themselves to the other person and drag them through eternity. Because they have so many of these whole and complete interactions, they feel secure - in themselves and in their expression of their sexuality. There are also married groups, which you have here on your world called "polyfidelity," which is simply taking the monogamy idea and expanding it so instead of two people, there are three or more. These marriage units are very loving, very connected, very committed to each other. This does not necessarily mean that they never live with one person or never have a type of marriage relationship with one person; many of them do. The difference is that they recognize immediately when it's time to move into something else. When you on your planet are in a relationship and feel that it's time to leave the relationship and you go and tell your mate, the mate quite often will be very hurt, will attempt to latch on to you, will show a lot of pain, etc. On your planet, however, 100% of the time when one of you feels the relationship is changed, both of you have. It's just that one person may not be recognizing it, or may be living in their own type of creation and cannot see what's really happening. This is changing now, as all of you are committing yourselves to your own personal growth. Within the Pleiadian system if the woman comes home and says, "This has been an absolutely wonderfully fulfilling relationship for me. I feel now that it's time for me to go to the other side of the planet and do something else," there's total understanding, total respect with no personal pain withheld on the part of the other person. They recognize that it must be the time, and there is a disconnection. This allows relationships to be very fluid and the sexual energy within the partners is not held or blocked but is channeled through their entire body and into their lives. One interesting contrast is that the Orions do not express sexuality in day-to-day life. They express their sexuality only when they're with their mate in a certain disciplined time period. The Pleiadians allow their sexual energy to permeate every aspect of their life. So if you have an interaction with a Pleiadian, you may feel that there's a lot of sensual energy coming from that being. It's because they do not differentiate between sensuality or sexuality and life. Sensuality or sexuality to them is life; it's the complete and full channeling of that energy through their embodiment. That philosophy is brought into their society by how they structure their relationships. Sometimes readers wonder why we Pleiadians are engaged in sharing this information. Well, we can honestly say that we have an investment in your flourishing. We believe there is great value to who you are, so we invest considerable energy in the guise of words to stimulate and stabilize you during these intense times. Our intention is to assist you to integrate and understand the galactic and solar knowledge energies so you can develop new ideas about who you are. Perhaps your realizations will create a spiritual revolution of cosmic proportions that will transform your lives and build a vital new probable world. Now, in all truth, any quest for the development of consciousness into new territory always involves challenges; otherwise it would not be a quest. The intensification of energy at the summer solstice period serves this purpose and will activate both potential trunk lines of probabilities: fear and the abdication of thinking, and love, where the value of life and the development of your mind are pre-eminent. Now, both probabilities will become more apparent to those with eyes to see. In order to thrive, you must truly embrace and energize the concept that your physical vehicle - the body that you occupy - is of inestimable value. You must learn how to be present in the here and now and master your capabilities in order to function in top form. Many multi-faceted opportunities await you. If you do the work, and if you learn to trust, the season ahead offers the unique occasion to consciously experience the super-intense energies and to use them to enhance your perceptions of reality. The new perceptions hold life. They hold meaning and ease and healing. These perceptions of knowing cannot be broadcast through the media; they are only transmitted energetically, orb to orb and cell to cell. Therefore, when your every moment is occupied, and your attention is given away, you lose the opportunity to use and develop your mind. We often remind you that one of the greatest truths about existence is that consciousness creates, and in 3D reality your thoughts, beliefs and emotions bring your world into being. Now, in this time of cosmic intensity, your thoughts, emotions and beliefs will be activated and deeply affected by energies from multidimensional and simultaneous reincarnational existences and your challenge will be to consciously manage the opening of channels of knowledge to simultaneous time. Yet the mind of your being, the spirit of your total essence, the cells of your body, the brain in your physical form, are all multidimensional all of the time. It is only the conscious you that has been conditioned to watch only one station, and therefore that is all you see. The activations of this summer may indeed stir up fear within the controllers, intensifying the arm of Big Brother, and resulting in more regulations and control than you have ever seen regarding movements, words, ideas and perceptions. The same galactic energy will also activate a new way of perceiving reality, triggering a restructuring of both your brain and your reality. The new perceptions will allow you to know and understand the greater meaning of events - where everything is seen as part of a connected, cooperative orchestration, significantly affecting each person's many lives. Your world has always been watched and studied by many, many beings, each with different intentions and agendas. Yet in general, you are supported by those who understand the intricacies of cooperation. And within the intricacies of cooperation there is a point, a purpose and a dignity to the rise of control and the abuse of power. We have said it before and will say it again: when forms of consciousness choose to forget, deny, deactivate and disdain their own power to create and to know, when they lose the value of the freedom to think, then they become part of the drama, the game, so to speak, that allows them to experience existence under the apparent control and dominion of others. The lessons and issues involve fear - fear of being in charge of one's life and fear of perceptions. Overcoming fear of personal power is a customary procedure in the development of conscious awareness; however, the question remains: how far will you go before valuing what is innately inside? Today's Armageddon involves a few who control the many who don't want to think for themselves versus those who want to know, and will know, and understand and choose to heal it all. From the point of view of the simultaneous ever-expanding now, all real healing involves a compassionate reinterpretation and energetic understanding of people, places, times and events. And even though you cannot yet see this vibration, as a frequency, its essence can unlock and diffuse many potential explosions and volatile situations. Overcoming fear of personal power is a customary procedure in the development of conscious awareness; however, the question remains: how far will you go before valuing what is innately inside? This summer's energies [1991 or 1992] will stir up major issues of public concern involving genetic engineering, cloning, and all manner of electronic intrusions. For many decades underground installations have been used as secret places for experimentation where scientists have been playing with the replication of life: human life, animal life, and even the combining of human and animal genes, recreating the so-called Atlantean abominations. You will be challenged with ethical issues concerning what can be done with the body. We remind you, though most of you are well aware, that clones do not have a spirit. They do not have the spark of life. The very best of babies will always be conceived in the love making, sexual expression process where sperm naturally fertilize an egg. If you were able to jump time and look ahead you would find that the fascist-branch of probabilities that springs out of this time attracts people who do not want to think, and who are very, very attracted to having their thinking done for them. They are chipped and programmed robots. Many functioning robots already exist: People are hypnotized and tranced out through their electronic addiction state of consciousness, where one appears to be functioning yet, brainwave patterns indicate an altered drugged-like state of stupor. The insidious slipping and dripping away of the power of the human mind is of grave concern. As these components of life take rise on the public forum, remember, the frequency you produce is more powerful than any written word, and, as true as truths come, there is an exceptionally extraordinary, powerful spiritual awakening occurring everywhere. Many people have done their work; they love their bodies and are spiritually and energetically prepared to be here. Use your mind to link into the telepathic connections, for they are extraordinarily heightened now. Set your intentions, and learn how to send out energy to be in the right place at the right time. For at no previous time in this period of living has the connection of thought to manifestation quickened to the present degree. This summer, thinking itself can be very dangerous, and that statement implies many innuendoes. Eventually, you will become very adept at creating everything with your mind; however, first you must focus on your physical form. Understanding, unraveling and releasing all of the pain you carry will make room for communication and knowledge from simultaneous lives, lives whose times and issues are very intimately connected to yours. The mind is truly universal in scope, yet paradoxically, it can also be dissociated into many separate compartments, all of which are conscious, to some extent, in their own world view. In a highly functioning state the mind can perform as an integrated collaboration of multiple identities that are working together to cooperate and explore, shining the light of knowledge into the subconscious mind, actually welcoming it to become conscious. The galactic intensifications of this summer will throw open the doors of the subconscious, releasing powerful old emotions. With this in mind, you must proceed in life, using this energy to follow your impulses, as you learn to trust your synchronicities, hunches and feelings. And, if you do not know how to feel, then you are missing some very important gear for playing this game. Feeling is activated by giving yourself permission to feel, and owning without judgment, the fountain of feelings that appear. Your feelings are valuable assets and help you gauge where you stand in accepting responsibility for your creations. When you do not acknowledge how you really feel, you stuff and deny your feelings and then subconsciously project onto others what you do not claim as your own. And, it is no easy task to claim as your own what you do not know you own, in this case, that which is stored deep in the subconscious mind. This is tricky territory you are plowing and pursuing, yet rest assured, dear friends, you are not alone in the pursuit of multidimensional connections. We are here, along with many others, to assist you with the process. Many simultaneous lives have the ability to connect to your mind, and into your now, attracted by the myriad opportunities you have to accelerate with such intense quickness. Many of your multidimensional-simultaneous lives had to walk far and live many times in order to earn and learn the knowledge that is at your fingertips. The unprecedented state of free knowledge is astounding, and it is also astounding to see how few choose to recognize it. In a highly functioning state the mind can perform as an integrated collaboration of multiple identities that are working together to cooperate and explore, shining the light of knowledge into the subconscious mind, actually welcoming it to become conscious. The gene pool of humankind is stressed right now, and the prevailing question is: can you clean your genes? Will you be able to transmute the global shock and growing anger? A clash of beliefs and values is brewing, and because of the intensified energies, those manipulating great deeds of damage will no longer be able to control the cover-up. The potential exists for a summer of shocking scandals set to rock people to their very core and make them question, "What has become of our world? What has gone wrong with our leaders? Why are we in this position?" Well, from our point of view, too many of you stopped valuing good honest fun. That may sound trivial, though it is not meant to be. It is a truth. Mirth, merriment, high spirits, delight, laughter and glee are all feelings that produce a very pure vibration, one that is highly sustaining. And, being that you are conscious forever, accumulating knowledge and experience in one form or another, it is best to take advantage of the opportunities at hand. Laziness will not serve you. You must compassionately reach out and empower other people, using words and energy to soothe their being. The intensity of telepathy is extremely high right now, and so is your power to seek what you want - this is the gift for mastering your mind. When you contemplate your ethics and values, and when the debates rage, as odd as this may sound - remember your childhood. Recall precious moments of gleeful vitality and times rippling with fun and excitement, for those moments are still vital and alive and will intercede energetically and enhance your now. You all have numerous contacts with other time line realities; the trick is to pay attention to the subtleties of life. You are all naturally multidimensional, with many facets of yourself to recognize. You can develop a mind with many personalities that are all linked together: harmonious, multi-tasked, and brilliantly working with your conscious mind. And in the moment, you can know they are all there: present and cooperative and you still have the freedom to be who you are. This represents the positive side of mind control, which is owning your mind, and is the opposite of the dissociated, fragmented, tortured approach. You can develop a mind with many personalities that are all linked together: harmonious, multi-tasked, and brilliantly working with your conscious mind. In this lifetime, and throughout all of existence, tragedy or triumph, you do design, create, volunteer and qualify for what you are engaged in. Accepting responsibility is part of restructuring your mind. We see probabilities and sense the psychic weather. We understand your dilemmas, and we also understand the blossoming of your consciousness and how large a part you play in this cosmic drama. We cherish you for your ability to be lost in the tenderness and depths of your private moments: snuggled in an embrace or catching the many sensuous scents of summer. You are remarkable beings, and you, too, shall soon come to realize what it is that we see. It is imperative that you trust the building of your perceptual expression. If it helps to write things down in order to understand what you are experiencing, then by all means do so. Remember, you are here as a pioneer of perception. So, be both kind and generous in your expectations of your physical form, for kindly thoughts and a nurturing attitude can truly be essential ingredients for determining the reality you structure and encounter. Intense energy can be used to activate internal awareness, to fire the kundalini, and stimulate the flow of qi within the body. When you believe in a flourishing thought manifested existence, you fortify and strengthen that frequency everywhere. Claim the use of your mind, and be present to learn from what you are receiving. Do not expect to read about the power and strength of the spiritual revolution in the controlled newspapers, nor will the hot line news shows make it the number one story. You must trust and tune in, and listen to your own form of communication, and then you will know and thrive. Remember, those who refuse to awaken feed those who control them. This is an old agreement, with no judgments. When conscious awakens, it needs no perpetrators. Claim the freedom to own your mind now for this issue will become the great challenge ahead for humankind and will intensify over the years. Remember, this time, it is not about you against anyone. If you follow the old path of us against them, then you will forever have fear and disempowerment as your companions. Seek the path that brings fun and joyful living, where you attract meaningful and significant relationships. Energetically pass on what you are learning, and trust in the benevolence of existence, for it is indeed so very fine. Demonstrate that the assignment and the playing of the game that you volunteered for so long ago can really be remembered now. Demonstrate your innate ability to transmute yourselves, to defy all toxins and all fascist actions. You have your own finesse, grace and style. Use it! The new common sense knows that all life is significant and that you must take care of it. Become enamored of yourselves, for you are a miraculous form of creation, capable of manifesting a magnificent and majestic version of existence through thought, word and deed. The healing is on, dear friends, so never forget that part. Heal your bloodline; heal your own pain and find the joy in being free of it! This is a most fortunate time to be alive and will go down in the annals of your reincarnational stories. Some day in the future you will reminisce and tell great tales about what it was like to be alive on Earth during the great intensification - a 25-year span of unfolding multidimensional energy, majestic, momentous and forever mysterious. For now, this summer solstice offers you a bit of an introduction to the arms of intensity. Intend to embrace true knowledge and true freedom. Journey well, dear friends, and make the best use of all of your nows. Their symbols were also at times birds or winged figures. They also used the symbol of the seven stars. Physically, and again we must generalize, they were similar in skin, hair and eye color to the Lyrans but much smaller. 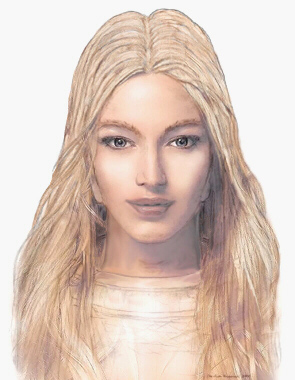 So, for instance, a typical Pleiadian woman would look very much like this channel in size. Now the Pleiadians had a very, very deep love of mankind. It would take too much time to explain why, but genetically they are connected to you, so often throughout history they have been drawn back to Earth in order to help humans. Not only do they have a genetic connection but they also have an emotional connection. They always tried to nurture and protect you like a mother. Now you know that you may have two parents, a mother and a father who love you very much, but at the same time these two parents may also fight over you. Sometimes they may even manipulate you to get back at the spouse. The same thing happened with these ETs. They often, in their love for you, fought over you. Unfortunately, they also at times manipulated you.